This handmade donut bath bomb looks good enough to eat! Decorated with white frosting, sugar balls, a mini soap popsicles, a soap lemon wedge, and glitter. 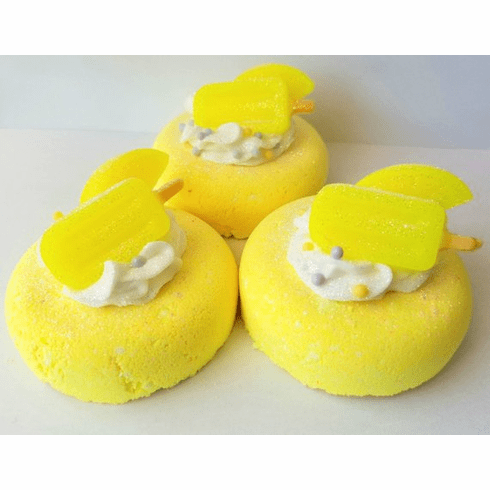 Bath bomb weighs approximately 5.5 oz and measures about 3 inches across is about 2.5 inches tall. Ingredients: baking soda, citric acid, kaolin clay, sunflower oil, almond oil, water, soap, meringue, cream of tartar, powdered sugar, fragrance, and colorant. Note: These bath bombs contain no SLS (a synthetic detergent) and will not bubble, only fizz.